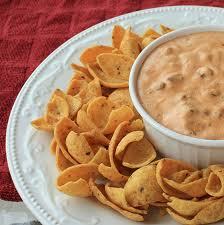 Sisters with Stuff: Absolute BEST party dip - Chili & Cream Cheese! So I'm guessing you've all heard of, made or tried this dip before but just in case it's new to you I had to share. This dip is one of my absolute favorites. I'm not a cream cheese kind of girl, I know.. it should be illegal, but I love this dip. I won't lie, after I eat 5 or 6 portions I feel bloated and disgusting but I'm still working to master the art of moderation. I've convinced myself that if I eat less appetizers like veggies or hummus dip I'll save calories therefore giving me permission to eat more chili dip. Makes sense right? This dip is a party favorite for me, I even have one of my best girlfriends on queue to bring it to all of my event's. So how to make it you ask. Well it's quite complex so make sure to take notes. Go to your local market or your Coupon stockpile and procure 2 can's of chili (one regular and one hot), pick up a block of cream cheese and a bag of Frito's Scoops. Put the Chili and the Cream Cheese in a saucepan over medium heat and stir. It's ready when the Cream Cheese is melted and mixed completely. Serve and scoop with Frito's. Voila! Super easy and super yummy, let us know if this is your first time trying it and tell us what you think. Be sure to check out our other "Dip" Articles like Dried French Onion Soup Mix, Make Your Own Sour Cream and the latest post for Quick DIY Tartar Sauce.